Hi! Leila here, your online Intuitive Life and Business Coach! 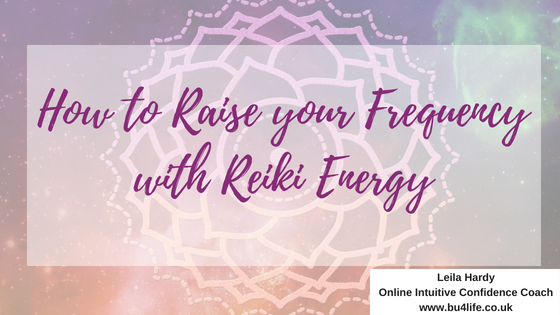 In this blog, I’m walking you through a simple 5 step process to raise your frequency with Reiki energy! If you’ve missed any of my blogs before now, head over to www.bu4life.co.uk/blog now to catch up on all of them! They’re bitesize, short, sweet and powerful! I am super passionate about helping women who are empaths, intuitives, healers and spiritually based coaches, just like you, to be confident and authentic in sharing who you are and what you are capable of with those you want to share your life with, whether that is with a partner, children, or clients in your work. Combining the subconscious mind and energy, I help you to identify and understand where, when, how and why obstacles that prevent you from being the happiest, highest, healthiest version of yourself possible, so you are empowered to release them and let them go as you step into your power to be who you really are! Raising your frequency is one element in becoming who you want to be and doing what you want to do. When it comes to energy, frequency represents the rate at which energy particles vibrate. Everything has a frequency. Solid, liquid, gas. Thoughts, feelings, emotions. There is a whole spectrum of energy frequencies that can be translated into thoughts, feelings and emotions-these are the way we interpret frequencies and change our own frequencies within our inner world. Higher frequencies are lighter, more spacious and when it comes to being aware of these frequencies in your own life, simply think about the times when you have been in love, felt abundant, happy, ‘blissed out’ after a massage, for example. Lower frequencies are thoughts, feelings and energy such as fear, hate, jealousy and sadness. Think of a time when you heard some bad news, or when you walk into a room when there has just been an argument. Can you already feel the difference inside of you when you think about times when you have felt both extremes of these frequencies? If you notice you are in an energy slump for some reason, or you want to manifest more of something in your life, try these steps to raise your frequency so you can feel better and manifest all that you desire! Become aware you need to raise your frequency-with awareness comes choice! You can then choose to use Reiki energy to raise your frequency. Observe the thoughts and feelings that are lowering your frequency and become clear on which frequencies you need to be raising to instead (these are often the opposite of the one you are feeling; hate = love; sadness = happiness; jealousy = contentment; fear = freedom; worry/lack = abundance, for example). Activate the Reiki energy to flow through you (not sure how to do this?) with the intention to clear and release any lower frequencies within your energy field and body and to invite in the higher vibrational frequencies you just gained clarity on in step 2. Follow with a Reiki self-session treatment and allow the Reiki energy to raise your frequency (alongside your intention) at any areas you notice there are shifts and changes in temperature or sensation. Complete this exercise by sitting within your heartspace and inviting all of the high frequency feelings and thoughts you want to have to feel better or to manifest what you desire, before coming back to your full awareness and going about your day. Repeat as necessary and be sure to surround yourself with the people, situations and information that will help you continue to raise your frequency! How does it feel to consider all the possibilities available to you when you raise your frequency using Reiki energy? If you love this exercise and know it is helping you to feel better and attract more of what you want to have, be and do in your life, then you will love taking part in Reiki Level I & II and Advanced Reiki Techniques Training, where I create a powerful energy container for you to raise your frequency and move your life towards all that you do want! Do you have questions about this, or about any of my Reiki courses? Pop them in the comments and I will reply to them!